In silver, the total open interest FELL by 1625 contracts DOWN to 172,592 with respect to YESTERDAY’S TRADING. In ounces, the OI is still represented by just less THAN 1 BILLION oz i.e. .862 BILLION TO BE EXACT or 123% of annual global silver production (ex Russia & ex China). FOR THE JANUARY FRONT MONTH IN SILVER: 2 NOTICES FILED FOR 10,000 OZ. In gold, the total comex gold ROSE BY 9,603 contracts DESPITE THE FALL IN THE PRICE GOLD ($10.40 with YESTERDAY’S trading ).The total gold OI stands at 475,227 contracts. we had 10 notice(s) filed upon for 1000 oz of gold. ii)This is a surprise move: the POBC cuts reserve ratios and then offers temporary funding and support for its largest banks. They wish to avoid a cash crunch!! i)A good commentary on what 5 territorial disputes may influence gold and/or problems for the world authorities: the two biggest of course is the South Chinese Seas and the Israel/Palestine conflict. ii)Gold trading today: higher with the Trump rally faltering: money flowing into gold and bonds! iv)This is a good one: John Embry states that we should watch out when the world finally realizes all of the fake news, manipulated (and false data), all hell will break loose. He outlines the most important commentaries of this past week, that which I have also highlighted to you. The total gold comex open interest ROSE BY 9,603 CONTRACTS UP to an OI level of 475,227 AS THE PRICE OF GOLD FELL $10.40 with YESTERDAY’S trading. We are now in the contract month of JANUARY and it is one of the poorest deliveries of the year. With the front month of January we had a LOSS of 35 contract(s) DOWN to 72. We had 41 notices filed YESTERDAY so we GAINED 6 contract(s) or AN ADDITIONAL 600 oz WILL STAND for gold in this non active delivery month of January. For the next big active delivery month of February we had a LOSS of 8914 contracts DOWN to 193,356. (feb 2016: 201,000 contracts). March had a LOSS of 80 contracts as it’s OI is now 925. We are on a par with respect to OI when we compare data for open interest re the Feb 2016 contract. And now for the wild silver comex results. Total silver OI FELL by 1625 contracts FROM 174,217 DOWN TO 172,592 AS the price of silver FELL 26 CENTS with YESTERDAY’S trading. We are moving further from the all time record high for silver open interest set on Wednesday August 3/2016: (224,540). We are now in the non active delivery month of January and here the OI FELL by 121 contract(s) FALLING TO 109. We had 122 notice(s) filed on yesterday so we gained 1 silver contracts or an additional 5,000 oz will stand in this delivery month of January. The next non active month of February saw the OI rise by 7 contract(s) RISING TO 261. The next big active delivery month is March and here the OI FELL by 2595 contracts DOWN to 132,041 contracts. We had 2 notice(s) filed for 10,000 oz for the January contract. Today the estimated volume was 228,499 contracts which is good. Today, 0 notice(s) were issued from JPMorgan dealer account and 0 notices were issued from their client or customer account. The total of all issuance by all participants equates to 10 contract(s) of which 0 notices were stopped (received) by jPMorgan dealer and 0 notice(s) was (were) stopped/ Received) by jPMorgan customer account. To calculate the initial total number of gold ounces standing for the JANUARY. contract month, we take the total number of notices filed so far for the month (1185) x 100 oz or 118,500 oz, to which we add the difference between the open interest for the front month of JANUARY (72 contracts) minus the number of notices served upon today (10) x 100 oz per contract equals 124,700 oz, the number of ounces standing in this non active month of JANUARY. we gained 600 oz of gold standing for delivery. average 17.407 tonnes per month vs last yr 51.534 tonnes total for 13 months or 3.964 tonnes average per month. IN THE LAST 5 1/2 MONTHS 74 NET TONNES HAS LEFT THE COMEX. ii) out of Delaware: 1926.000 oz ????? exact weight?? Thus the initial standings for silver for the JANUARY contract month: 559(notices served so far)x 5000 oz +(109) OI for front month of JAN. ) -number of notices served upon today (2)x 5000 oz equals 3,330,000 oz of silver standing for the JAN contract month. This is STILL huge for a non active delivery month in silver. We gained 1 contract(s) or an additional 5,000 oz will stand. At first day notice for the January/2016 silver contract month we had 1,845,000 oz standing for delivery. By he conclusion of the delivery month we had only 575,000 oz stand. YESTERDAY’S confirmed volume was 84,049 contracts which is huge. 1. Central Fund of Canada: traded at Negative 6.0 percent to NAV usa funds and Negative 6.1% to NAV for Cdn funds!!!! Note: Sprott silver trust back into POSITIVE territory at +0.57% /Sprott physical gold trust is back into NEGATIVE territory at -0.29%/Central fund of Canada’s is still in jail. At 3:30 pm est we receive the COT report which gives position levels of our major players. For several weeks, the commercials were goading the specs to go short. That change last week and the commercials went net short and the specs net long. those large specs that have been long in gold added 4144 contracts to their long side those large specs that have been short in gold added 6585 contracts to their short side. those large specs that have been long in gold added 4636 contracts to their long side. those large specs that have been short in gold added a tiny 1931 contracts to their short side. those small specs that have been long in gold pitched a tiny 82 contracts from their long side. those small specs that have been short in gold added a tiny 182 contracts. Conclusions: commercials go net long changing direction from last week. They went net long by 2705 contracts. The large specs went net short by 2441 contracts and that is very bullish for gold. those large specs that have been short in silver pitched 2473 contracts from their short side. those commercials that have been long in silver added 3603 contracts to their long side. those commercials that have been short in silver added 6402 contracts to their short side. Those small specs that have been long in silver pitched 1077 contracts from their long side. those small specs that have been short in silver added 1005 contracts to their short side. large specs go net long by 4800 contracts; commercials go net short by 2799 contracts. It sure looks like JPMorgan is controlling the silver comex market. Gold performs well in inauguration years (see table) and has seen average gains of 15% in inaugural years since the 1970s. Given the degree of uncertainty, divisiveness and conflict that Trump’s election has already created – both in America and internationally, it seems almost certain that the many risks as President Trump takes power will lead to higher gold prices. Besides the myriad of risks today and arguable the most uncertain geo-political situation since World War II or the height of the Cold War, gold investors and buyers can look to Presidential history, as gold has recorded has average gains of 15% in inaugural years since 1974. This may be due to the fact that the first year of many administrations is frequently a time of significant change and increased uncertainties and risks. Markets are concerned that the US presidential handover and advent of President Trump will lead to volatility and turmoil in 2017 which will likely impact risk assets such as stocks. The price of gold has already gained 5% this year and appears to be consolidating just above US$1,200 an ounce today. Investors can take a look at history for signal and indications as to how gold and stocks might perform this year. A look at recent presidential transitions supports optimism among traders over the metal’s prospects. 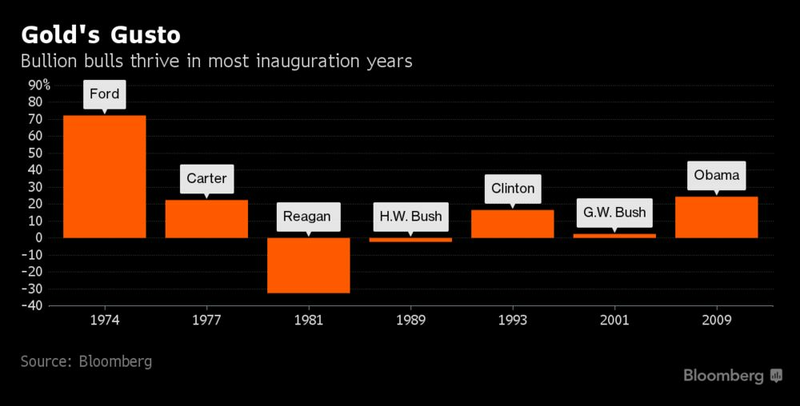 Gold has averaged gains of almost 15 percent in years marking the inauguration of a new president since the 1970s, advancing in five of those seven years. In contrast, the S&P 500 index of equities declined in four of those years for an average loss over the period of 0.9 percent. From Presidents Gerald Ford to Barack Obama, bullion has often served as a haven in times of political flux. The metal has climbed about 5 percent this year as questions over the possible economic impact of Donald Trump’s policies add to investor angst over Brexit and mounting trade frictions. Bulls reason that gold will extend its gain as scant details of Trump’s fiscal stimulus program and tensions with trading partners including China unnerve investors. Like Trump or loathe him, most would acknowledge that his recent press conference, ill judged tweets and recent transition to power has been a complete mess. Today is “T day” or “Trump day” as the world awaits the inauguration and advent of Donald Trump as President of the United States. The eyes of the world are on Washington and traders and investors will be keeping an eye on the U.S. stock and bond markets, the dollar and gold. Trump’s first speech as President, expected some time after his swearing in at 1700 GMT, may see President Trump offer more detail on his fiscal and economic policies, especially infrastructure spending and taxation, in addition to trade policy. When Barack Obama was sworn in eight years ago, the dollar strengthened by more than 4% in a day. This reassured markets and lulled many investors into a false sense of security regarding the dollar and markets. In the subsequent month after Obama’s inauguration, gold was 16% higher and in the course of the following 12 months, gold rose by 30% and gold was 23.4% higher in the calendar year 2009. Markets and the dollar are unlikely to welcome Trump’s inauguration with such enthusiasm today. However, there is that possibility but investors should fade the short term noise and focus on the fact that gold is likely to perform well in 2017 and in the coming years for some of the reasons outlined below. Trump’s continuing spat with America’s top intelligence agencies including accusing them of Nazi like tactics shows the level of geo-political uncertainty and risk facing the U.S. and the world. Trump has been smeared by senior elements in the CIA in another “dodgy dossier” akin to that of the “weapons of mass destruction” dossier which helped get the U.S. and the UK into the disastrous Iraq war. The tactics used in smearing Trump as a “sexual deviant” are akin to those used by FBI Director J. Edgar Hoover against politicians and others including Martin Luther King in the 1960s. Martin Luther King was an outsider, a political activist, a civil rights activist and a man of peace who fought peacefully for the rights of the poor and the disenfranchised , especially the African-American community. Trump is a maverick business man and today is set to become an insider and one of the most powerful men in the world. A civil war between a U.S. President and senior elements in the intelligence agencies will likely lead to political instability on a massive scale and is a recipe for disaster. We do not like to have to consider the ‘assassination’ scenario but the precedent of JFK’s assassination looms large. Trump is hated by large sections of the American population and indeed by very powerful operators in the politics and intelligence circles in Washington D.C. and in the U.S. There are alas likely lots of willing patsies. The dollar was on the back foot again yesterday despite some strong data, most notably some strong numbers in the Philadelphia Fed Manufacturing Index and a very low initial jobless claims number. New Treasury Secretary Steve Mnuchin sparred with Democratic lawmakers on various topics, and actually expressed support for a strong US dollar, placing him at odds with President Trump and attempting to clarify comments by the president-elect that hit the currency earlier this week. Mnuchin, a former Goldman Sachs banker, told a Senate confirmation hearing yesterday that a strong currency remained important over the long-term, reflecting America’s attractions as an investment destination. On Monday Trump appeared to break from decades of the strong dollar policy in the US by saying that the greenback’s strength is “killing us” and was preventing American companies from competing internationally and with China. Trump and Mnuchin’s comments highlight the uncertainties and many conflicting signals over Trump’s financial and economic policies. Now more than ever, the short term is nigh impossible to predict. We believe that Trump will attempt to end the ‘strong dollar policy’ or at the very least will try and push the dollar lower in the short term in order to boost American exports and jobs in a desperate attempt to kick start the moribund U.S. economy. There is also the somewhat important matter of the U.S.’ near bankruptcy with its $20 trillion nominal debt and over $100 trillion in unfunded liabilities (more on this below). The market will dictate the value of the dollar in the long term not the pronouncements of Trump or his Treasury Secretary. Investors should fade the short term noise and focus on the diversification benefits that owning physical gold will provide in the coming months and years. Contrary to superficial figures and analysis, Obama has left Trump an enfeebled and massively indebted U.S. economy with some 95 million out of work. This accounts for Trump’s popularity among large sections of the working and middle classes. President Obama is set to leave a massive near $20 trillion debt crisis for his successor. The U.S. national debt reached $19.96 trillion last week and increased by roughly $1 trillion a year during Obama’s Presidency and during the so called fake news “recovery.” Obama and his government, like Bush before them, spent money like drunken sailors and pushed the U.S. closer to the brink of bankruptcy. There is also the not insignificant matter of the between $100 trillion and $150 trillion in unfunded liabilities – for medicare, medicaid and social security as the baby boomers retire. The U.S., like the EU and most western nations, is “kicking the can down the road.” Consequently, a U.S. and global debt crisis looks likely during the first term of President Trump. This continuing surge in the U.S. national debt to the $20 trillion level means that the U.S. is now the largest debtor nation in the world – by a significant margin. Its total debt of over $120 trillion means it is the largest debtor nation the world has ever seen. This profligacy will be paid back by the people of the U.S., and most likely by people in all indebted western nations, in the form of higher taxes, higher interest rates, inflation, currency wars involving devaluations and almost certainly a currency crisis involving the dollar and other leading fiat currencies. Owning gold coins and bars in your possession and owning bullion in allocated and most importantly in segregated accounts will continue to protect and grow wealth in the coming years. Amid a weakening yuan and a tumbling Bitcoin (amid crackdowns on ‘virtual’ capital outflows from China), Chinese money is moving to bullion as investors seek an alternative to the ‘managed’ fiat paper offered by the PBOC. In the week through Monday, China attracted $52 million, the biggest inflow into commodity-linked exchange-traded funds of all countriestracked by Bloomberg. As Bloomberg reports,Huaan Yifu Gold ETF, China’s largest ETF backed by raw materials, is getting all the attention, attracting almost $72 million last week. Huaan Yifu attracted the third-biggest inflow into gold ETFs in the week through Monday, behind Frankfurt-listed Xetra-Gold, which got $172.9 million, and London-listed Source Physical ETF, which lured $73.6 million. ETF holders are bucking the trend in China’s jewelry market that saw the nation’s gold imports from Hong Kong fall in November to the lowest since January. There are other troubles triggering capital flight and sending money to gold. The International Monetary Fund warned that China’s continued reliance on policy stimulus measures and the slow progress in addressing corporate debt raise the risk of a “sharper slowdown or disruptive adjustment.” The IMF issued the warning even as it raised the nation’s growth forecast for this year by 0.3 percentage points to 6.5 percent. Gold trading today: higher with the Trump rally faltering: money flowing into gold and bonds! When looking at the latest weekly fund flows, it is clear that the Trump trade is over if only for the time being. As BofA reports, citing EPFR data, the last week saw the largest precious metal inflows in 5 months ($1.3bn), the 4th consecutive week of bond inflows ($4.5bn), and a week of modest $1.7bn equity inflows, however US stocks saw $2.5 billion in outflows, representing the 4th weekly outflow in the past 5 weeks. This is a good one: John Embry states that we should watch out when the world finally realizes all of the fake news, manipulated (and false data), all hell will break loose. He outlines the most important commentaries of this past week, that which I have also highlighted to you. You know when to buy gold: it’s when nearly every trader and commentator tells you that gold is going lower and you should sell it. This is Harry Dent on 10th January: “I still see gold landing somewhere between $650 and $750 in the next year or so” i. Dent invokes Elliott Wave Theory. EWT states that a bull market is comprised of impulse waves of three separated by two corrective ones, totalling five all together. Bear markets are made up of three waves, two impulse in the direction of the bear trend, separated by one consolidating countertrend. I am simplifying the theory considerably to make a point, but I do know my onions, having in the past taught, examined and lectured on EWT on behalf of the UK’s Society of Technical Analysts. Ralph Elliott only applied his theory to equity markets. Reflecting the greater value over time placed on stakes in human progress, it makes sense. It is modern chartists who have extended its use to other markets. But money and currencies? The first decision you must make is which of the two variables in a price is in a bull market. It is commonly thought gold is the variable, but the chart below illustrates the problem is more likely fiat currencies priced in gold. 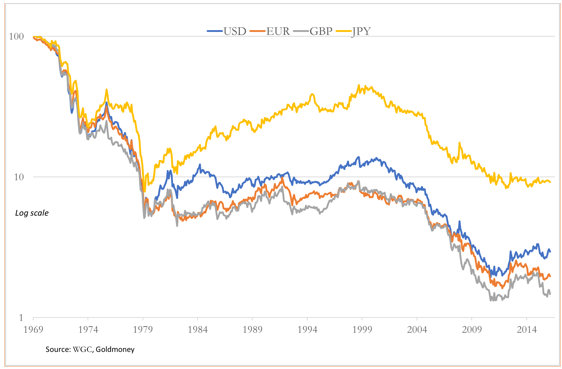 The four currencies shown, including the dollar, have been firmly in bear markets since the year before Bretton Woods was abandoned. Note also that the price scale in the chart is logarithmic, so these are enormous losses for fiat currencies. So, Dent and his fellow-travellers are effectively using a theory that was never intended to be used outside equity markets to recommend their clients and subscribers play a counter-trend rally that’s already over five years old. Elliott theorists are also oblivious to a mathematical impossibility. If a currency is deemed to be in a bull market, it moves up in fives. If the other currency being measured against it, or commodity if you must, is in a bear market, it moves down in threes. How can one be moving in fives, while the other moves in threes? It cannot, it is a story of square pegs and round holes, and wholly disqualifies EWT applied to gold. You cannot rule out the possibility that gold will go to Mr Dent’s $650 to $750, but for that to transpire I suggest two things would have to happen. Interest rates would have to be raised beyond the point where bad debts and falling bond prices break the banks, and the Fed would have to convincingly signal to markets that it is prepared to stand aside and let the banks fail. I believe these two conditions to be extremely unlikely. In the event of an interest-rate induced crisis, it is far more likely the Fed will repeat the successful formula (from the Fed’s point of view) of providing unlimited credit, as it did post-Lehman. A pathological fear of deflation ensures the outcome. And unlike the time of the Lehman crisis, investors will know the solution in advance, and their response will differ accordingly. It was the post-election move in gold that wrong-footed everyone. A Trump victory was quickly turned from an event that brought with it heightened uncertainty, to one that promised higher interest rates, higher bond yields, and a strong dollar. The winners in this about-face, in the gold contract on Comex at least, were the bullion banks, which were very short. It suited them to drive gold and silver lower to close their short positions, and/or show favourable year-end book values. Amateurs in the game, who are nearly always caught out by the bullion banks’ periodic bear-raids, take the aggressive fall in prices as evidence that they should panic at what often ends up being the bottom of the market. These banks are still short, having not managed to buy back all their positions, which is probably one reason why the current rally is so strong. And things are not looking good for the bullion banks, with prices running away from them with only a partial increase in open interest. As can be seen in the graph above, measured in gold the dollar has lost 97% of its value since 1969. If the dollar was a stock, informed opinion would be that it is bust and should not be bought. The same would be true of sterling, which has lost 98.5%, and the euro (including its components before 2001), down 98%. The legendary trader of yore, WD Gann, reckoned that any stock that fell to less than ten per cent of its high was probably bust, and should be avoided. It’s a good rule of thumb, and on that measure, not even the yen has a future. The confusion for investors seeking guidance from so-called experts is they are always presented with charts showing gold priced in dollars. The immediate and unwritten assumption is that it’s the gold price that moves, and the currency is constant, overlooking the fact that the dollar persistently loses its purchasing power, confirmed by the almost continuous increase in the consumer price index. Showing gold priced in dollars, or any other currency for that matter, also encourages the myth that gold is an investment which either outperforms or underperforms cash. Technically, gold is not an investment. It is either a commodity, money or both, depending on your point of view and how you define things. Almost all financial commentators, including most gold bugs, make this very basic mistake. Another myth that must be addressed is that gold is no longer money. For most of the world’s population, it most certainly is money, mainly because of its superior qualities as a store of value. Our second chart shows what has happened to selected Asian currencies over the same time-frame as the first chart, and includes the US dollar for comparison. A Turkish national, holding on to his lira, has lost 99.99999% of his purchasing power measured in gold. An Indonesian has done somewhat better having lost 99.92565% on his rupiahs, but we are splitting hairs. The point is, does anyone seriously think the nearly two billion people behind this sample regard their governments’ fiat currencies as having any use beyond a means of rapid exchange? Obviously not. Gold will always be regarded by all Asians as the preferred money, to be bought and held by selling the fiat. The only people who argue that gold is no longer money are Western-educated economists and their followers, having influence over an audience which mostly doesn’t care one way or another. These economists and their epigones probably number no more than a million or so, being a percentage of the global population that is not too remote from the percentage losses an Asian has suffered by holding on to his national currency. The economists’ motivation is not so much a search for the truth, but more of a consequence of the sponsorship of their education by governments, and subsequent employment by both government agencies and a compliant financial establishment. Economists are like the three wise monkeys in their support for government currencies. The United States government does not want to see any challenge to its primacy over issuing the world’s reserve currency, and does everything to protect it, with a special dislike (or is it fear?) reserved for gold. Therefore, establishment economists dance to this tune, and are paid to do so. The US Constitution explicitly states that gold and silver are money, yet since President Roosevelt banned the ownership of gold coin, gold bullion and gold certificates in 1933, US citizens have been denied this constitutional right. Few complain. Furthermore, when US citizens were once more permitted to own gold, any notional profits arising from the dollar’s debasement has been deemed profit and subject to tax on capital gainsii. It is no coincidence that the dramatic declines in purchasing power for all fiat currencies, in addition to those illustrated in the two charts included in this article, stemmed from the time the dollar’s purchasing power could no longer be maintained at $35 to the ounce. 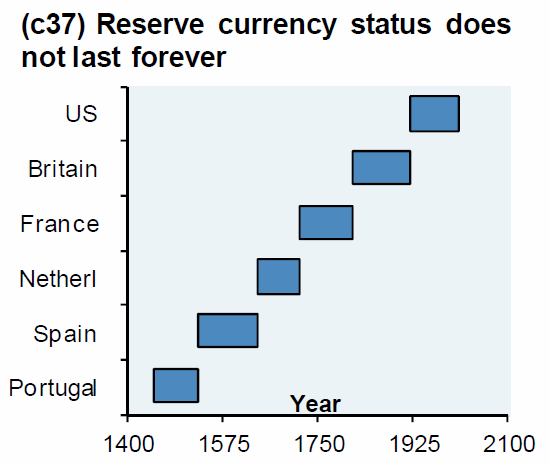 The collapse in fiat currencies’ purchasing power since then has been in two broad moves, the first in the 1970s and the second from 2002 to 2011. Yet still, we have the establishment mainstream in financial markets claiming that gold is not money, and every time the dollar pathetically rallies from its deathbed against gold, they chorus “We told you so”. Eurozone demand could be the surprise for 2017. The influence of Western-centric ignorance will probably be tested again later this year, as the Eurozone desperately tries to preserve its future and that of the euro. Only this week, President-elect Trump fired a starting gun on the EU’s political disintegration, by offering Britain and any other leavers quick and practical trade deals. This is a major about-turn from American post-war policy towards Europe. The change of policy is all fine and dandy, but it could be a trigger for the end-game of a financial mess in the Eurozone, whose resolution looks insoluble without massive monetary expansion. No wonder prescient Germans are already accumulating gold, and there can be little doubt that other EU nationals will increase their hedging against the euro’s ultimate failure as well, because that failure is becoming more likely by the day. Sophisticated ignorance over gold goes one step deeper as well. Many commentators, knowingly or unknowingly, form a judgement based on their interpretation of the charts, and then select from a range of fundamental arguments to suit. 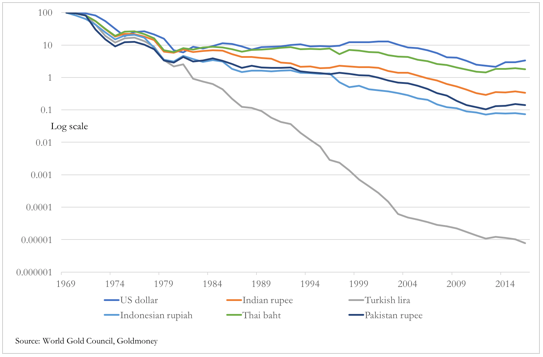 Take India, where the currency has been mostly withdrawn. Recorded gold demand will presumably fall because there is little currency available to the unbanked masses for payment. This ignores unrecorded increases in smuggling, stimulated by the enhanced risk to the purchasing power of the rupee, already down 99.67% since 1969. Add to this stories that China has been restricting import licences for gold. For the chartist, the two largest sources of demand for physical gold are conveniently removed from the market. Throw in a strong dollar, and how could anyone argue against a falling gold price? Except, since Harry Dent made his prediction on January 10th, gold has risen inexorably, despite these negatives. At the very least, he and his ursine tribe are being badly squeezed. What should worry these people even more is that the dollar’s falling purchasing power today against gold is driven by physical demand for bullion, and is despite the dollar’s strength against other fiat currencies. Some important physical buyers appear to be waking up to the inflation and currency risks ahead. It should be clear to any intelligent observer that 1.3 billion Indians will chase up food prices later this year, because crops are not being planted through lack of cash. Monetary inflation in China is likely to lead to rising prices for a further 1.4 billion Chinese. Property bubbles abound throughout Asia, with new skyscrapers going up everywhere. It is redolent of the conditions that led to the Asian crisis in the late nineties, on a grander scale. Crucially, measured in dollars the strength of energy and raw material prices throughout 2016 was an early warning of future price inflation everywhere, and expanding bank credit in America is fuelling the trend as well. The conditions for a reversal of the forty-year trend of declining price inflation are now in place, negating any bearish argument against gold. We don’t know who is actually buying physical gold, suffice to say the really big money has very little exposure. But now that the status quo is being challenged and price inflation is back on the agenda, central banks and other big buyers now find gold attractive. I have written at length elsewhere about how price inflation is going to be a growing problem, and how restricted the Fed is in responding to it. The danger is increasingly being recognised by the other commentators. Additionally, Trump’s planned economic stimulus is unfortunately timed, coming on top of an economy that is being successfully inflated by expanding bank credit. Instead of declining, gold has every reason to go considerably higher, measured in those continually depreciating fiat currencies. Treasury Secretary nominee Steven Mnuchin told lawmakers today the long-term strength of the U.S. dollar is important and said President-elect Donald Trump’s comments that the currency was too high weren’t meant as a longer-run policy. 3b Japan 10 year bond yield: FALLS TO +.066%/ !!!! (Japan buying 100% of bond issuance)/Japanese yen vs usa cross now at 115.16/ THIS IS TROUBLESOME AS BANK OF JAPAN IS RUNNING OUT OF BONDS TO BUY./JAPAN 10 YR YIELD FINALLY IN THE POSITIVE/BANK OF JAPAN LOSING CONTROL OF THEIR YIELD CURVE AS THEY PURCHASE ALL BONDS TO GET TO ZERO RATE!! 3n Higher foreign deposits out of China sees huge risk of outflows and a currency depreciation (already upon us). This can spell financial disaster for the rest of the world/China forced to do QE!! as it lowers its yuan value to the dollar/GOT a SMALL DEVALUATION DOWNWARD from POBC. 30 SNB (Swiss National Bank) still intervening again in the markets driving down the SF. It is not working: USA/SF this morning 1.0076 as the Swiss Franc is still rising against most currencies. Euro vs SF is 1.0724 well above the floor set by the Swiss Finance Minister. Thomas Jordan, chief of the Swiss National Bank continues to purchase euros trying to lower value of the Swiss Franc. Global shares were mixed, equity futures, the dollar and crude rose as investors focused their attention on today’s inauguration of Donald Trump as U.S. president. While the early tone is well bid, some traders anticipate a volatile session, with speculation that a bout of “sell the inauguration” could cap the aging Trump rally, which started with his inauguration. Despite last night’s Yellen speech which was more dovish than her remarks just 24 hours earlier, and which suggested that the US economy is “not overheating”, the dollar managed to rebound from overnight losses and was trading 0.2% higher this morning. The early gains came after China reported its first economic expansion in 2 years (conveniently with president Xi in Davos) with GDP rising to 6.8% after quarters of decline. However for the year, China’s GDP growth declined to the slowest pace in 26 years, despite a record debt load and record weak Yuan. “[Trump is] likely to talk about job creation and unifying the U.S. and we may have to wait a bit longer for details on economic measures,” said Natixis fixed income strategist Cyril Regnat. “It’s clear that investors have reached a level where they are prepared to wait and see what the Trump administration has to offer,” said Ric Spooner, chief market analyst at CMC Markets Asia Pacific Ltd. in Sydney. Trump’s inauguration ceremony “will be followed by a speech that will be carefully decoded by those looking for signs of things to come in the new U.S. administration, an exercise that amounts to political astrology in an era characterized by a shakeup of the old rules of the game,” Citigroup’s chief global political analyst Tina Fordham wrote in note. As Bloomberg notes, rallies in the dollar and equities are easing this week before Trump is sworn in as the 45th American president, with investors growing anxious for indications the administration will follow through on pro-growth campaign promises. Billionaire investor George Soros said the euphoria among stock investors since Trump’s victory will end as uncertainty takes over. The Dow Jones Industrial Average has churned in its tightest range ever over the past month. European stocks opened weaker before recouping some losses to trade flat. Trading was choppy with mining shares, the biggest beneficiaries of the reflation rally spurred by Trump’s election win, the biggest drag on the indexes. The Stoxx Europe 600 Index was poised for its worst week since early December while the pound slid after a report showed U.K. retail sales fell at the fastest pace in almost five years last month. Gold headed for a fourth weekly advance. Fund flows in the run-up to Friday’s inauguration indicate investors moving into less risky assets and locking in some profits in banking stocks and high-yield debt. Precious metals funds saw their first inflows in 10 weeks, according to data from fund tracker EPFR and Bank of America-Merrill Lynch while money was pulled from funds focused on financials stocks and high-yield bonds. The Stoxx Europe 600 Index little changed as declines in miners offset gains in energy shares. Futures on the S&P 500 Index rose 0.2%. The S&P500 is heading for its biggest weekly drop of 2017. Contracts on the Dow Jones Industrial Average were little changed on Friday, and may be pressued by the disappointing earnings from both American Express and IBM. 10Y yields were flat at 2.5%, erasing previous declines. Government bonds retreated across the European Union. Looking at regional markets, Asian stocks traded mixed following an uninspiring lead from Wall Street with participants cautious ahead of the US Presidential Inauguration and as the region digests Chinese GDP data. ASX 200 (-0.7%) lagged amid continued weakness in financials with mining names also pressured after iron ore prices fell over 1%. Conversely, Nikkei 225 (+0.3%) initially traded choppy alongside fluctuations in JPY, but was able to finish higher as JPY weakened slightly while Shanghai Comp (+0.7%) and Hang Seng (-0.6%) were mixed after a slew of tier-1 Chinese data including GDP in which the Y/Y figure beat expectations, although the pace of growth for 2016 was at its slowest in 26 years. Finally, 10yr JGBs traded higher amid a mostly cautious tone in the Asia-Pac region, while the BoJ were also in the market for a respectable JPY 1.12trl of JGBs ranging from 1yr-25yr-F maturities. Chinese GDP YTD (Q4) Y/Y 6.7% vs. Exp. 6.7% (Prey. 6.7%): slowest yearly growth in 26 years. In Europe, it has been a quiet morning with European bourses failing to find any firm direction, slight underperformance however has been observed in basis materials with Rio Tinto shares leading the FTSE 100 lower amid the declines in Iron prices.11 out of 19 Stoxx 600 sectors fall with basic resources, retail underperforming and oil & gas, construction & materials outperforming. 51% of Stoxx 600 members decline, 46% gain. While large UK supermarkets, Tesco’s and Sainsbury’s are soft today amid a negative note from Exane. Fixed income markets trade marginally in the red with Bunds lower by around 14 ticks, breaking below the 163.00 level, while slight outperformance in the curve has been notable in 5s and 10s. In currencies, the Bloomberg Dollar Spot Index was up 0.2 percent as of 10:38 a.m. in London after falling as much as 0.3 percent. The gauge is heading toward its first weekly advance since the period ending Dec. 23. The pound dropped 0.3 percent to $1.2301 and the euro retreated 0.3 percent to $1.0637. Nerves among USD longs were telling in late Asia and first thing in London were telling as the presidential inauguration ahead carries the ever-present risk of way lies ahead in terms of trade and currency policy in particular. This has since been reversed to some degree as UST yields push higher towards the highs seen at the very start of the year, but USD gains look a little more hesitant given events later in the day. USD/JPY is eyeing a return to the mid 115.00 highs seen yesterday, but notable was the EUFt/USD return to the upper 1.0600’s again despite was an unchanged status quo at the ECB Thursday, with tapering considerations dismissed out of hand to see the accommodative stance maintained despite rising headline inflation. For GBP, a softer than expect retail sales read in the UK for Dec has put a modest dent in the Pound based on the EUR/GBP upturn, which as yet struggles for momentum above the .8650 mark. Cable has slipped below 1.2300, but partly due to the broader USD impact. 1.2250 support has yet to be tested. In commodities, the Trump inauguration ahead is prompting much caution across all asset classes, but given the prospective impact on infra structure spending and trade policy which has ramifications for China in particular, base metals in particular have been trading flat to marginally lower over the last 24-36 hours or so. Gold was finding a modest bid as the USD retreated a little this morning, but with US Treasuries pulling back again, we have seen the yellow metal slip back below USD1200.00, although it is likely that general risk sentiment will provide some support given today’s key events In Washington. Oil prices have stabilised after some notable losses in recent sessions, but the USD50.00 handle looks safe for now. In my 2017 outlook presentation in Paris I asked 4 questions where the audience were able to vote on the answer. The first was when will the next US recession occur? The audience voted 45% for 2019 and 45% for 2020 or beyond. The rest were 2017 and 2018. So they were pretty optimistic that the cycle will extend. When I asked this question to two big audiences on my travels last year around 70% answered 2017 or 2018 so expectations have seemingly changed. I also asked whether Italy will still be in the single currency in 5 years time. 91% said yes. Last year around 80% said yes in similar polls so again a more optimistic crowd. When asked whether the ECB will be fully out of QE by YE 2018 around 80% said no so it seems investors, although optimistic, still feel the ECB need to keep stimulus high over the next two years. Finally I asked what was the most likely event to occur out of the following four by the end of 2018? a) 10 year USTs above 5%, b) the S&P 500 trading below 1500, c) England winning the football World Cup or d) France electing Le Pen. Interestingly answer a) won with nearly 50% and the biggest shock was that England winning the World Cup scored 40% on this measure with the other two making up the last 10%. So only a few French investors thought a Le Pen victory was more likely than 5% yields, the S&P 500 below 1500 or England winning the World Cup. So overall an optimistic crowd contrasting with surveys I did last year at various conferences. So there’s no doubt sentiment has changed in 2017 even if markets are in a bit of a lull. This should change soon one way or another as Donald Trump’s inauguration today marks the start of what promises to be a fascinating ride with a wide range of outcomes. Trump is set to speak at 2.30pm GMT and all we know right now is that Trump was said to have prepared the speech himself, with some advice and counsel from advisers as well as from some historians specifically regarding the length of the speech. Trump was also said to have told reporters that the speech will aim to unite America but we know little more than that at this stage. So it remains to be seen just how market moving this will be. One topic which is certainly hogging the spotlight right now is the administration’s views on the US Dollar. Treasury secretary nominee Steven Mnuchin was the latest to address the currency debate yesterday and added to the confusion by saying that Trump’s observation on Monday that the Dollar is too strong was not meant as a “long-term comment”. Instead, Mnuchin said that “long-term strength over long periods of time is important” and that “I believe that’s a reflection of (the US having) the most attractive investment environment in the world”. Mnuchin also made comments about bank regulation, saying he supports the Volcker rule. On top of this he also said that he would look to raise the debt ceiling sooner rather than later, while also saying that he would label China a FX manipulator if warranted. Over in markets, Dollar strength was again a theme yesterday after the USD index closed up +0.22% although it did pare earlier gains of as much as +0.80%. The other theme yesterday was the second successive day of Treasury yields climbing higher. In fact 10y Treasury yields closed up 4.4bps higher yesterday at 2.475% – which is a YTD high – and have all of a sudden risen 17bps from the intraday lows on Tuesday. The data helped at the margin but it appeared to be Yellen’s speech the day before and then those comments from Mnuchin which helped drive yields higher. The Fed Chair spoke again this morning but it seems to largely be a repeat of what she said previously, with little new information to highlight. Meanwhile US equity markets never really got going yesterday with the S&P 500 finishing -0.36% with rate sensitive sectors in particular underperforming. Before we go any further we’re straight to China now where the latest monthly data dump is in. It has revealed that China’s economy grew 6.8% yoy in Q4 last year which was slightly more than the 6.7% expected by the market. For full year 2016, China reported growth of 6.7% which, while being the slowest pace since 1990, did end up right in the middle of the government’s official target. Meanwhile other activity indicators were mixed. Retail sales rose +10.9% yoy in December (vs. +10.7% expected) which is a tenth higher than that in November, although industrial production did slip two-tenths to +6.0% yoy (vs. +6.1% expected). Finally fixed asset investment was reported as rising +8.1% yoy for the full year (vs. +8.3% expected). In terms of the market reaction Chinese equity markets are higher in response with the Shanghai Comp and CSI 300 +0.54% and +0.69% although a Bloomberg report suggesting that the China Financial Futures Exchange is to relax curbs on trading might also be helping the positive tone. Elsewhere it’s more mixed. The Nikkei is +0.14% although the Hang Seng (-0.58%), Kospi (-0.19%) and ASX (-0.58%) are down. Moving on. The other focus for markets yesterday was the ECB meeting outcome. As we’d expected, a patient message was preached. Our European economists noted that the Bank is looking through the rise in headline inflation as the ECB’s patience and willingness to wait to extract the underlying trend from inflation was emphasized. Draghi said the Council will “continue to look through” HICP inflation “if judged to be transient and to have no implications for medium-term price stability”. The ECB President also outlined a framework for judging the “sustained adjustment” of inflation. In the view of our colleagues, “looking through” inflation implies less risk of an early tightening move in March. June is still the earliest timing for a tapering decision. Away from that it was interesting to hear comments (Bloomberg) from hedge-fund manager George Soros yesterday in Davos. Speaking about Brexit he said that “it is unlikely that Prime Minister May is actually going to remain in power” and that Britons are in denial about what the economic impact of Brexit could be. When commenting about Europe Soros added that the laws that govern the EU are “not appropriate to the current circumstances” and that while he acknowledges it can still be saved, those making decisions in Brussels “know that Europe is not functioning”. Before we look at the day ahead, it was an overall decent day for economic data in the US yesterday. Housing starts were reported as rising a bumper +11.3% mom (vs. +9.0% expected) in December while the November data was also revised up. Building permits (-0.2% mom vs. +1.1% expected) did miss but again we saw upward revisions to prior months. Meanwhile initial jobless claims declined to 234k from 249k which is the lowest since November. Finally the Philly Fed manufacturing survey ticked up 3.9pts to 23.6 (vs. 15.3 expected). That’s actually the highest level since November 2014 and more importantly, the detail revealed broad-based improvement which is indicative of a decent improvement in business spending this year according to our US economists. Looking at today’s calendar, this morning in Europe the early data comes from Germany where the December PPI print will be released. Thereafter we’ll get retail sales numbers in the UK for the month of December which is expected to show a -0.4% mom decline excluding fuel. There’s nothing of note in the US this afternoon although we will hear from both the Fed’s Harker (2pm GMT) and Williams (6pm GMT). Of course the main event today will be Donald Trump’s inauguration as the 45th US President. The swearing-in ceremony is due at 2.30pm GMT. Before we wrap up, in addition to all things Trump related this weekend it’s also worth highlighting a couple of other potentially interesting events. French presidential candidate Marine Le Pen and Holland’s Freedom Party head Geert Wilders are amongst political leaders speaking at a rally of European nationalist parties in Germany tomorrow. Meanwhile on Sunday, France’s leftist parties are due to hold the first round of their primary. So worth keeping an eye on both those events. China’s macro data avalanche was a mixed bag. The headline GDP grew more than expected (+6.8% YoY) but Industrial Production disappointed and while retail sales rose more than expected, fixed asset investment growth missed. Credit expansion at close to twice the pace of GDP growth will be tough to sustain without putting financial stability at risk. On a long-term horizon, the economy seems to be filled by ever-growing debt rather than investment or consumption. As a reminder, Bloomberg notes that a shrinking working-age population, reduced scope for additions to the capital stock and diminished space for productivity gains mean that China’s potential growth is slowing. Bloomberg Intelligence estimates potential growth at 7.1% in 2016, down from 7.3% in 2015 and on a path to 6.5% by the end of the decade. Of course, there is a cost to propping up GDP like this. And that’s debt. It’s hard to look past the headline number without considering the gargantuan lending China’s banks were forced to pump into the economy to keep things chugging along. We know that policy makers are aware of this risk given the recent signals about prudent monetary policy and a tolerance for slower growth. This is a surprise move: the POBC cuts reserve ratios and then offers temporary funding and support for its largest banks. They wish to avoid a cash crunch!! Overnight the PBOC injected another CNY95 billion into its banking system bringing the total weekly injection to a record CNY1.13 trillion. However, it was not enough and overnight China allowed its five biggest banks to cut their reserve requirement ratio by 1% taking it down to 16% thus temporarily lowering the amount of money that they must hold as reserves to relieve pressure in its financial system as demand for cash surges ahead of the Lunar New Year holiday, Reuters reported. The banks affected by the move iclude ICBC, CCB, Bank of China, Bocom, and Agricultural Bank of China. The last time the central bank cut RRR was Feb. 29, 2016. The move is expected to release approximately 630 billion yuan in liquidity. The dramatic moves come in a bid to avert a cash crunch heading into the country’s biggest holiday of the year. Earlier in the week short-term funding costs had spiked to their highest levels in nearly 10 years on fears that liquidity was sharply tightening, sparking a jump in the yuan currency. But China watchers polled by Reuters had not expected a cut in RRR until the third quarter of 2017, as such a move would put more pressure on the ailing yuan. Following the massive central bank liquidity injections, key funding and money market rates showed signs of easing on Friday but remained well above normal levels. But wait, that’s not all, because also overnight, the PBOC said it provided a “temporary liquidity facility” to some major commercial banks for 28 days to help ease a cash crunch before the Lunar New Year holiday. According to Bloomberg, the operation provides more effective liquidity transmission before the week-long break, the People’s Bank of China said in a statement Friday. The PBOC said the new lending facility will have a funding cost for banks that’s around the same as open-market operations for a similar 28-day period, which is about 2.55 percent. That means the tool differs from cutting the ratio of deposits big banks must hold in reserve and suggests a fresh evolution of tools policy makers have been overhauling. Commercial banks had 11 trillion yuan ($1.6 trillion) of sovereign and financial bonds outstanding as of December, Ming said, and have pledged about 43 percent of those to access funding through central bank open market operations, limiting room for further such operations. The PBOC’s statement Friday didn’t say whether the temporary funding required collateral. Should none be required, that would be unusual because most such tools involve collateral. The PBOC has shifted toward selective tightening after a two-year easing cycle. President Xi Jinping and other policy makers decided at their annual economic conference last month China should plan prudent and neutral monetary policy this year to prevent financial risks. “It’s likely the central bank will use temporary liquidity facility as a regular tool in the future to ease liquidity shortage before quarter-end or holidays,” said Xia Le, chief economist at Banco Bilbao Vizcaya Argentaria SA in Hong Kong. The PBOC is using a new tool because older ones offer funds at a high cost and longer duration than needed, and it’s wasteful for banks that need money for five days to have to borrow for a full year, Xia said. While in the past the PBOC has engaged in similar moves ahead of the new year, the latest move suggested there were additional factors involved in draining liquidity: “Today’s move seems to suggest that liquidity conditions are tighter than authorities’ expectations, as capital outflows remain strong,” said Zhou Hau, senior emerging markets economist at Commerzbank in Singapore. The central bank will restore the RRR for the five banks to the normal level at an appropriate time after the holiday, according to Reuters’ sources. “This is a temporary adjustment, and is mainly in response to the cash withdrawal, tax payment and reserve payment. (The RRR) will go back to the normal rate after the Lunar New Year holiday,” one source said. The PBOC said later on Friday that it will provide temporary liquidity support for several major commercial banks for 28 days to ensure adequate liquidity ahead of the Lunar New Year, according to a notice posted on its official microblog. The funding cost for the liquidity support will be about the same as the open market operations rate over the same period, the PBOC said, without specifying any requirement for collateral. As noted previously, Chinese liquidity always tightens in China ahead of the Lunar New Year holiday, which this year starts on Jan. 27 and ends on Feb. 2, as households and companies usually withdraw huge amounts of cash from banks. The central bank typically responds by injecting ample funds into the market. But some traders say its injections this year have barely been keeping up with heavier demand. This year, the holiday also extends over the month-end, when corporate cash demand increases and some tax payments are due, adding to the strain. Analysts estimate that every 50 basis point cut in RRR systemwide effectively injects an estimated $100 billion worth of long-term cash into the economy, which recorded its slowest growth in 26 years last year. The post-Brexit euphoria appears to have abruptly vanished in December as UK core retail sales plunged 2.0% month-over-month, the biggest drop since May 2011. Ironically, this crack in the ‘Brexit Boom’ occurred an hour before U.K. Chancellor of the Exchequer Philip Hammond told a Davos gathering on Friday that an inflation pickup will put a damper on consumers this year. Cable tumbled on the print (not helped by London home pre-sales plunging). As Bloomberg reports, possible explanations include price increases and consumers scaling back purchases after taking advantage of Black Friday discounts the previous month. Mild weather also probably affected clothing sales — down 3.7 percent on the month — though the weakness in the sector was broad-based, with turnover at food, household goods and department stores all falling. The decline could be a portent of 2017, with the pound’s 17 percent drop since the June vote to leave the European Union boosting import costs and fueling a sharp upturn of inflation. That means consumers, who have weathered the Brexit vote so far, now face a squeeze that will eat into real incomes. That could potentially hurt growth in an economy that relies heavily on their enthusiasm for spending. The price of retail goods sold in December, as measured by the deflator, increased on an annual basis by 0.9 percent, the most in three years. Consumer-price inflation jumped to 1.6 percent, according to a report earlier this week, and is forecast to keep climbing through 2017. While most surveys see it around 3 percent by the end of the year, some expect a figure closer to 4 percent. “This is likely to be the theme for the rest of the year — higher prices will reduce disposable income and hurt consumer spending growth,” said Alan Clarke, an economist at Scotiabank. But that was not the only bad news to spoil the Brexit bravado, as Bloomberg reports sales of London homes under construction last year dropped to the lowest level since 2012, leaving developers with a record number of unsold properties. Purchases of homes currently being built fell 22 percent to 20,695 from a year earlier, according to a report by Molior London seen by Bloomberg. The number of unsold properties that are under construction surged 14 percent to 25,139 units in the period, the highest since the researcher began collating data in 2009, the report shows. A spokesman for Molior declined to comment. London’s residential real estate market is being buffeted by headwinds ranging from near-record prices to higher sales taxes and uncertainty surrounding the terms of the U.K.’s exit from the European Union. Home values in the British capital fell for eight consecutive months through November with central luxury properties declining the most, LSL Property Services Plc and Acadata said this month. A record 24,817 homes were completed last year and, based on current sales rates, it will take 1.3 years to sell the properties that have yet to find a buyer, the Molior report shows. The measure, which assumes no further stock is completed, stood at 0.8 years at the end of 2015. A good commentary on what 5 territorial disputes may influence gold and/or problems for the world authorities: the two biggest of course is the South Chinese Seas and the Israel/Palestine conflict. For several places around the world, 2017 could be a watershed year, as various territorial disputes threaten to boil over amidst a climate of global uncertainty. Much like fights over territory itself, the concept of territory has disputed roots. It is not uncommon to associate ‘territory’ with ‘terra’ as in terra firma (or terroir to wine connoisseurs). However, some scholars suggests an alternative root – ‘terror’. Here, territory belongs to those who are able to instill fear such that those living within its boundaries are obliged to respect the laws and norms of their respective rulers. This is the very core of the Hobbesian concept of sovereignty and gets to the heart of territorial disputes. At the moment, fear may be the more useful concept when evaluating contested territories – fear present in governments, policy makers, and businesses. More acutely, potentially significant shifts in policy from the incoming Trump administration have created significant ambiguity in the role the United States may play in these disputes. Other challenges have also served to fan the flames in several specific hot spots. Any such shift, from recent elections or other sources, will likely have follow-on effects as states, NGOs, and other actors alter their own positions in response. Below are five territorial disputes that may be exacerbated over the next year. China claims large portions of the South China Sea. To bolster its position, the Chinese government has built artificial islands to turn a dispute about the ocean into one about land. This was investigated by an international tribunal in the Hague during the summer of 2016. Since then, Washington has taken a relatively cautious approach. However, during a Senate hearing on January 12th, US Secretary of State nominee Rex Tillerson, made it clear that he believes the Chinese stance to be unacceptable. “You’re going to have to send China a clear signal that, first, the island-building stops, and second, your access to those islands is also not going to be allowed,” he told senators. Although the official Chinese response was to downplay the significance of this statement, its state run media interpreted Tillerson’s comments more aggressively. An estimated $5 trillion in trade travels through the South China Sea, meaning even a slight disruption can have profound effects on economies and investors across the globe. The United States has long maintained that it acts as an honest broker in the Israeli – Palestinian conflict. While this was view has not always been shared by all parties, US policy has remained predictable and stable for nearly 30 years. The incoming Trump administration appears to be signaling a clear and vocal shift. Since the early 1990’s, the US has generally viewed Israeli settlements as a barrier to furthering the peace process. Furthermore, US policy on retaining its embassy in Tel Aviv, rather than Jerusalem is nearly as old as Israel itself. This may change abruptly with the appointment of David Friedman as US ambassador to Israel. In the past he appears to have diverged from US policy on both issues. It is unclear if this signals a shift in actual policy or if there is simply a stronger voice in the incoming administration to do so. Either way, it is likely to increase uncertainty for Israeli and Palestinian governments, NGOs, and investors approaching key questions in their respective portfolios. Since Russia’s 2014 intervention in Ukraine, global reaction has been near universal condemnation: the EU, US, and others began sanctions soon thereafter. These may have contributed to both the decline in the value of the ruble and Russia’s poor financial performance over the last two years. On January 15th, 2017 Donald Trump signaled a willingness to lift sanctions in exchange for a nuclear arms deal between the US and Russia. In recent years Russia has been among the three largest oil producing nations. However, sanctions have made it difficult for Moscow to benefit from oil exports; lifting sanctions would likely reverse this. Perhaps more importantly is the exchange of sanctions for a nuclear arms deal, which would further entrench Russia’s territorial claims in Crimea. In August 2007, a Russian submarine descended nearly four kilometers (2.5 miles) under the Arctic to plant a flag on the seafloor. As many investors are no doubt aware, the claim is not only a way to gain access to the potentially vast natural resources under the ocean; rather it also has the potential to determine control of shipping lanes as Arctic ice melts. Since 2015 Russia has attempted to legitimize this claim through UN recognition. However, it was not until August of 2016 that the UN Commission on the Limits of the Continental Shelf began its evaluation. 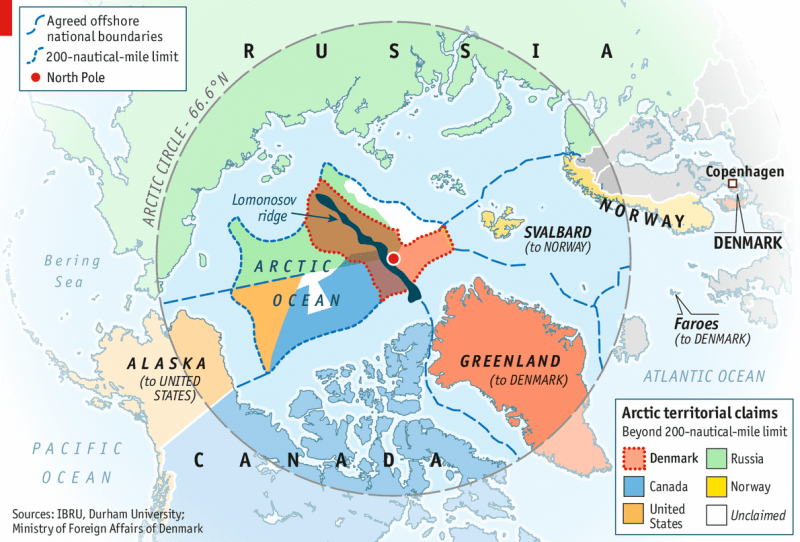 It is important to note that US, Canada, Norway, and Denmark have also made claims in the region. Russian claims, however, are larger and are more developed than those of other nations. While the UN Law of the Sea governs many of these disputes, the US is the only claimant that is not party to the treaty. Interestingly, the US Defence Department has urged the Senate to adopt the treaty, so that the US can gain at seat at the table on Arctic (and other) deliberations. With a nearly unprecedented number of former generals set to play civilian roles in the Trump administration, such a shift is perhaps more likely than in years past. Is Banxico using a distracted day to intervene on the cheap? Or pre-empting Trump’s speech? While a desperate Saudi Arabia jawbones how well OPEC production cuts are going, the road ahead looks like a surge in US Shale supply is coming. Following a brief dip in the previous week, US oil rig counts soared 29 to 551 last week – the biggest weekly rise since April 2013 – to the highest since Nov 2015. With the OPEC production deal holding, at least for the moment, questions have now arisen over how prospects look for the cartel’s biggest producer. It’s been a strange few years for the Kingdom of Saudi Arabia, as its endured budget deficits for the first time in its modern history, stagnation in oil prices and rising competition from other OPEC members and the American shale boom. Recently, talk has centered on the Saudi monarchy’s glimpse of the future: the Vision 2030 plan, whereby it hopes to diversify its economy and end its dependence on the mercurial oil and gas market. But can the world’s biggest oil producer and OPEC’s de facto leader pull it off? In the short term, Riyadh will continue to feel the pain of lower-than-normal oil prices. The growth outlook for Saudi Arabia has been slashed, as the International Monetary Fund (IMF) announced on January 16 that the world’s largest oil producer would see its GDP grow by only 0.4 percent in 2017. The estimate comes on the basis of the continued low price of oil, but more importantly on the country’s slashed oil production: as a result of the recent OPEC production deal, Saudi Arabia has agreed to keep its production level at or below 10 million bpd. This has resulted in a cut in its growth outlook, down from 2 percent in October, according to Bloomberg. This comes after anemic growth in 2016, where GDP expanded by only 1.4 percent. If oil prices stabilize, and the country’s economic forecast improves, GDP will likely expand by 2.3 percent in 2018. The official Saudi response decried the IMF’s results as overly conservative. A government spokesman declared that Saudi growth would be “north of 1 percent,” citing the anticipated investment in renewable energy and a stimulus packaged the Saudi government was planning for the private sector, according to Bloomberg. The Saudi leadership had been pivotal in the campaign to bring about an OPEC cut, after resisting production deals for years. The stakes were raised this year, as draining cash reserves and a resistant American energy sector convinced Riyadh that cuts were needed to boost prices. The cuts have come, surprising many analysts, and the OPEC deal looks set to hold at least for the time being. Along with the cuts to production, the Saudi government looks to cut spending. The 2017 budget, the most detailed in the country’s history, lays out a series of measures for stabilizing state finances, which plunged into deficit in 2016 as a result of the crash in prices. The state is the largest employer and spender in the Saudi economy, which is largely built on the oil and gas industry. Cuts to construction projects and social programs, estimated at around $20 billion, will help to balance the budget. The deficit in 2016 was around 12.6 percent, down from 2015’s budget deficit of 15 percent, and if prices stay where the Saudis expect them to, between $50 and $43 per barrel, the budget gap in 2017 will be smaller still. The official Saudi estimate has the deficit amounting to 7.7 percent of GDP in 2017. The current fiscal forecast is based on the National Transformation program (NTP) which aims at a balanced budget by 2020. The plan, also known as Vision 2030, was announced in 2016 and is intended to diversify the Saudi economy away from petroleum. The largest single component in the Saudi economic sector, the massive state energy company Saudi Aramco, is to be privatized, and its assets used to develop the country’s manufacturing, tourism and other sectors. Gestures towards building investors’ confidence in the Saudi economy have included last year’s $17.5 billion sovereign bond sale, the largest such issue in history and a move which attracted bids totaling $67 billion, according to Bloomberg. Looking ahead, the Saudi government is expected to raise another $15 billion on international markets this year, boosting debt levels as high as 30 percent of total GDP by 2020. It is hoped that by then the budget will be back in surplus, likely spurred on by further sales of Saudi Aramco. Investors are spurred on by the attractive Saudi rial-dollar rate, the continued strength of Saudi oil production (which has shown no signs of slowing down), and the clear interest within the current Saudi government in serious financial and economic reforms. This should make it easy for the Saudi state to raise all the funds its needs on international markets. But that’s in the short term. Borrowing can only cover budget deficits for so long, and growth in the non-oil economy will have to be kick-started if the Saudi vision can be realized. The problem is that Saudi non-oil prospects aren’t great, with the non-oil economy on the edge of recession pending the release of some Q316 data. Government borrowing an increase in contracts in 2017 should boost non-oil growth from 0.2 percent to 0.8 percent, hopefully reaching 1.9 percent in 2018, according to CPI Financial. Public debt will grow from 1.6 percent in 2014 to 23 percent in 2018. This is still a historically low rate for a country the size of Saudi Arabia, but the growth in debt could have investors alarmed and scare markets away from accepting more and more Saudi debt, which looks likely to fund continued growth past 2017. So, while the Saudi forecasts are upbeat, and Saudi rhetoric around oil prices remains buoyant and hopeful, storm clouds are hovering on the horizon for the oil kingdom. Should the Vision 2030 plan succeed, and the country pivots away from oil and gas, fostering non-oil growth and a balanced budget in the next five-to-ten years, it will have justified Saudi enthusiasm. But oil remains the most important component in the Saudi economic picture, and the assertions of the 2017 budget and future forecasts are based on the assumption that oil prices will climb back up to $60 by 2018. Should that increase fail to occur, and the Saudi treasury continue to sell off more bonds and accumulate more debt, things in Riyadh could get more unstable. The 30 yr bond yield 3.068, UP 2 IN BASIS POINTS from THURSDAY night. USA dollar index early FRIDAY morning: 101.35 UP 18 CENT(S) from THURSDAY’s close. the Italian 10 yr bond yield is trading 52 points HIGHER than Spain. The British pound at 5 pm: Great Britain Pound/USA: 1.2354 : up 18 BASIS POINTS. The USD Index fell for the 4th consecutive week (longest losing streak since Feb 2016).. The Mexican Peso was lower on the week again (6th week on a row) but ripped higher today by the most since the election!! *TRUMP: ALL DECISIONS ON TRADE, FOREIGN AFFAIRS, TO BENEFIT U.S.
President Trump’s economic plan will create 25 million new jobs in next decade, “return to 4 percent annual economic growth,” “lower rates for Americans in every tax bracket, simplify the tax code, and reduce the U.S. corporate tax rate” according to a statement just posted on the White House wesbite. The plan starts with pro-growth tax reform to help American workers and businesses keep more of their hard-earned dollars. The President’s plan will lower rates for Americans in every tax bracket, simplify the tax code, and reduce the U.S. corporate tax rate, which is one of the highest in the world. Fixing a tax code that is outdated, overly complex, and too onerous will unleash America’s economy, creating millions of new jobs and boosting economic growth. As a lifelong job-creator and businessman, the President also knows how important it is to get Washington out of the way of America’s small businesses, entrepreneurs, and workers. In 2015 alone, federal regulations cost the American economy more than $2 trillion. That is why the President has proposed a moratorium on new federal regulations and is ordering the heads of federal agencies and departments to identify job-killing regulations that should be repealed. With decades of deal-making experience, the President also understands how critical it is to negotiate the best possible trade deals for the United States. By renegotiating existing trade deals, and taking a tough stance on future ones, we will ensure that trade agreements bring good-paying jobs to our shores and support American manufacturing, the backbone of our economy. The President plans to show America’s trading partners that we mean business by ensuring consequences for countries that engage in illegal or unfair trade practices that hurt American workers. By standing side-by-side with America’s workers and businesses, the President’s policies will unleash economic growth, create 25 million new jobs, and help Make America Great Again. TOOMEY: Would you agree that many of the periods of strong economic growth that we’ve had in recent decades have corresponded to periods of a strong dollar and that often, if our economy is performing well and the world perceives our economy to have a bright future, the inevitable result will be a stronger dollar? MNUCHIN: Let me just comment on that because I think that the U.S. currency has been the most attractive currency to be in – for very, very long periods of time. I think that it’s important and I think you see that now more than ever. The currency is very, very strong and what you see is people from all over the world wanting to invest in the U.S. currency. I think when the president-elect made a comment on the U.S. currency, it was not meant to be long-term comment. It was meant to be that perhaps in the short term, the strength in the currency as a result of free markets and people wanting to invest here, may have had negative impacts on — on our ability in trade. But I agree with you, the long-term strength – over long periods of time, is important. And again, that’s a reflection of – I believe we have the most attractive investment environment in the world, and we just have to protect our U.S. companies so they’re not forced abroad. According to a report from The Hill this morning, President-elect Trump’s transition team is already working with career staff at the White House on plans to slash federal spending. The Hill reports that significant cuts are expected to the budgets of the Department of Commerce, Energy, Transportation, Justice and State, among others, and would total $10.5 trillion over 10 years. While details are scarce now, a 200 page “skinny budget” document is expected to be released within the first 45 days of Trump’s administration with a “full budget” to be released toward the end of his first 100 days in office. Two members of Trump’s transition team are discussing the cuts at the White House budget office: Russ Vought, a former aide to Vice President-elect Mike Pence and the former executive director of the RSC, and John Gray, who previously worked for Pence, Sen. Rand Paul (R-Ky.) and Speaker Paul Ryan (R-Wis.) when Ryan headed the House Budget Committee. Vought and Gray, who both worked for the Heritage Foundation, are laying the groundwork for the so-called skinny budget — a 175- to 200-page document that will spell out the main priorities of the incoming Trump administration, along with summary tables. That document is expected to come out within 45 days of Trump taking office. The administration’s full budget, including appropriations language, supplementary materials and long-term analysis, is expected to be released toward the end of Trump’s first 100 days in office, or by mid- to late April. Ultimately the Trump budget is expected to be modeled after a blueprint published by the Heritage Foundation which envisions cutting or completely eliminating several programs that most people don’t even know exist and therefore likely will not miss in the least. The Heritage blueprint used as a basis for Trump’s proposed cuts calls for eliminating several programs that conservatives label corporate welfare programs: the Minority Business Development Agency, the Economic Development Administration, the International Trade Administration and the Manufacturing Extension Partnership. The total savings from cutting these four programs would amount to nearly $900 million in 2017. At the Department of Justice, the blueprint calls for eliminating the Office of Community Oriented Policing Services, Violence Against Women Grants and the Legal Services Corporation and for reducing funding for its Civil Rights and its Environment and Natural Resources divisions. At the Department of Energy, it would roll back funding for nuclear physics and advanced scientific computing research to 2008 levels, eliminate the Office of Electricity, eliminate the Office of Energy Efficiency and Renewable Energy and scrap the Office of Fossil Energy, which focuses on technologies to reduce carbon dioxide emissions. Under the State Department’s jurisdiction, funding for the Overseas Private Investment Corporation, the Paris Climate Change Agreement and the United Nations’ Intergovernmental Panel on Climate Change are candidates for elimination. But while many Trump supporters will applaud the efforts to scale back the federal government, passing such an aggressive piece of legislation through Congress will be a challenge given that the Republican-controlled House just voted against a similarly aggressive budget in 2015 by a margin of 132 – 294. That said, the effort should make for some fun tweets over the coming weeks. 250,000 protesters, many of them paid and bussed in, are going to Washington D.C. to try to disrupt or stop Donald Trump from being sworn in as the 45th President of the United States. The police and military are ready for them as tens of thousands of armed officers and soldiers are on hand to make sure the inauguration goes ahead as planned. Outgoing Vice-President Joe Biden was in Davos, Switzerland, at the World Economic Forum and sounded the alarm about the populist movement sweeping the globe. Biden warned that the so-called “progressive” movement is at risk of collapsing around the world. Maybe the “progressives” should try to come up with policies that actually help the majority instead of lying to get their way. One big lie that comes to mind is Obama Care, which was called the Affordable Care Act. It ended up being much more expensive than promised and skyrocketed health insurance rates for the vast majority of people. Now, Obama Care is falling apart around the country, and that is one of the big reasons Democrats lost in November. The mainstream media (MSM) is back in the phony polling business. During the 2016 Presidential campaign, all of the MSM had Hillary Clinton winning by a landslide, when, in fact, it was Donald Trump that won by a landslide. Now, the MSM is back at it again saying Trump’s “favorability is dropping.” It has been revealed that the latest ABC/Washington Post (WaPo) poll oversampled Democrats to get a bigger unfavorable number. Not being honest and fair is the definition of “Fake News.” A Rasmussen Reports poll done at the same time as the ABC/WaPo poll had a fair sample and revealed most Americans gave a favorable rating of Trump. 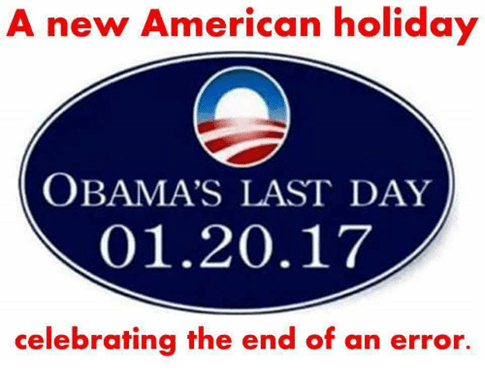 Finally, President Obama set a record on his last days in office commuting the sentences of criminals. He commuted more sentences that the last 13 presidents combined. He commuted the sentences of traitors and drug cartel members, but did not pardon Edward Snowden or pre-pardon Hillary Clinton.